Choose what do you prefer ?! 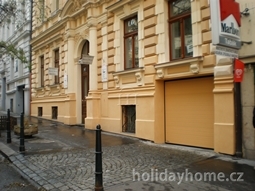 We offer short term accommodation in popular residential area - Prague 2 - Vinohrady, 100 m from "NĂĄmÄstĂ­ MĂ­ru" - AmerickĂĄ 37. Historic building of our hotel was recently renovated. We offer comfortable budget hotel accommodation and safe car parking. 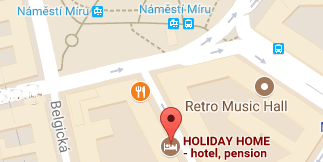 We offer short term accommodation in Prague center, in popular residential area - Prague 2 - Vinohrady, just 100 m from "NĂĄmÄstĂ­ MĂ­ru" in Americka street, AmerickĂĄ 37. Historical building of our guesthouse was recently renovated. There is available modern elevator (in midfloor only). 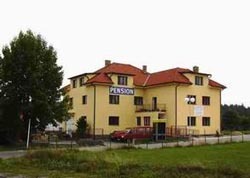 Besides of clean and comfortable budget hotel accommodation we offer also safe car parking in next door block of flats, just 200 m from our building. We have just few guests rooms now. They are double or twin, used also as single and 3-4 beds are also available. All rooms & bathrooms were recently renovated. Rooms are simply furnished, wall to wall carpeting, beds, table with chairs, wardrobe case, armchair, table lamps & wall decorations. Each room have private ensuit bathroom with shower, sink, WC, hairdryer & other usual equipment. Each room has also phone, sat. TV, electronic SAFE box and free WiFi internet connection. The WiFi is reachable in all the house. All rooms & other house area are strictly non-smoking. Smoking is possible outside of house only. either in front or at back yard. No breakfast is offered in our facility. But there are many alternative options around. We provide list and map of such options nearby. Clients can also have their own breakfast here, as el. kettle, fridge and simple dishes are available either directly in room or in shared tea kitchenette next to the room, with sitting for 4 persons. The tea kitchenette does not allow real cooking. 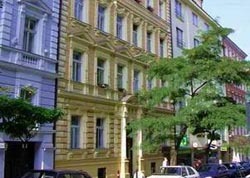 Our accommodation is ideal for visiting Prague downtown, for vacation or any further leisure stay and visit of central Prague. 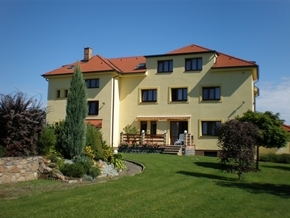 It is ideal as well for business trips, visiting congress, for training or other business meetings in Prague centre. You can easily reach most of Prague sightseeing, (museum, theatre, concert halls, exhibition halls, cultural events and institutions located in Prague center, Prague 2, Nove Mesto, Prague 1, Old town, Mala strana or Hradcany. Lot of that our clients use to walk only. Another option is to use very good public transport. There are tram stops (4, 16 & 22) just 100m from our pension. Metro station of line "A" of Prague underground - Namesti Miru is just 200 m from our house.